Pamper yourself with the soft and plush comfort of this king-size reversible summer quilt. The green and multi-coloured floral patterns embellished with leaves gives the feel of a spring garden to any room. Its unique style is complemented by its polyester construct, which makes it durable, odour-free and extremely comfortable. 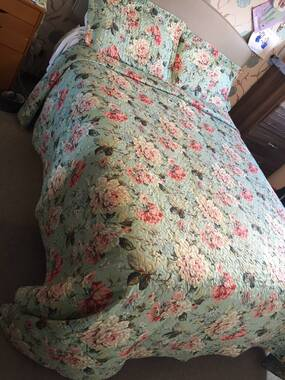 The quilt (Size 260X240 Cm) is reversible and comes with 2 pillow shams (Size 70X50 Cm). The scalloped border enhances the beauty of the quilt. Although the colour is stated as 'green' - this beautiful throw is more duck egg with just a smidgen of green in there somewhere. It's an incredible pattern and I was SO surprised at the quality. The two pillow covers which come with the throw are again, good quality. I'm thrilled to pieces with it, and it looks WAY more expensive than I paid for it. When our daughter visits and sees this one she's going to ask why I didn't buy her one! LOL. There is nothing negative I can think of to say about this quilt/throw. It really is a fabulous item and I love it. Lovely bed set. Fantastic price. It looks good. Wish it was a duvet instead of a throw over. But it looks good with its matching pillow cases. Lovely colour & pattern not too heavy.